The one room that everyone hates cleaning is the bathroom. 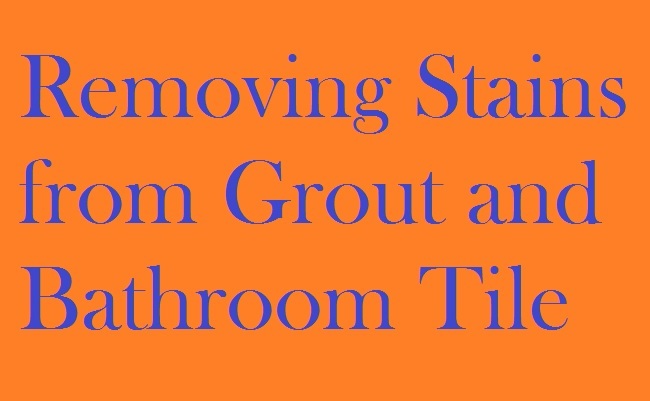 Especially when it comes to the bathroom tile and removing stains from grout. There are so many cleaning products available out there; it is difficult to determine what are the best washroom cleaning products.You are always looking for one that does not require excessive scrubbing on your hands and knees, one that actually works. A simple spray and wipe is what you are looking for when it comes to washroom cleaning products making your life easier. No one likes to look at their bathroom and see mold and mildew stains on their tile and grout. Other common problems associated with tile and grout are hard water spots, discoloration, and soap residue. You are always surprised how quickly these problems resurface, and how difficult they are to remove. How can you get these surfaces clean without damaging them? Not to mention the difficulty of cleaning the highly porous grout. Those stains sink in deep. There are some things you do not want to do. For example, scrubbing harder is not necessarily a good thing. This can scratch the surface and damage your tile. That is why you want to find a good washroom cleaning product that is gentle on surfaces, but hard on dirt and stains associated with the bathroom. Also, you will want to look for cleaning products that are for your specific type of tile and other materials in your bathroom. Provided here, we will discuss some of the best quality washroom cleaning products that are available on the market. There are also some home remedies that might work for your washroom as well. A specified combination of these household products along with liquid dish soap can be a great cleaner. Now, this mix is great for those more borne in stains. The baking soda acts as a cleanser and deodorizer. Its mild abrasiveness help get up some of those sunk in stains out. Now this might sound like something you have never heard of, until you hear the example of OxiClean. But that is just one example product. This type of cleaner works due to the active ingredients of sodium per carbonate, sodium carbonate, and other chemicals with long names. These products will pull all of the stains, dirt, and grim off your tile and out of your grout. Whichever named product you use, make sure to read the label and follow the directions carefully. There are many of these available on the market. Too many to list here. But when you are conducting your research, there are a few things you need to look for. You will need to make sure the product is safe for the type of tile and grout that you have in your bathroom. You would also want to choose one that has anti-fungal properties. This helps prevent mold growth. Bleach can be a great way to kill all bacteria and get your whites white. You want to keep in mind the fumes when using bleach, and make sure you can have your bathroom well ventilated when using it. There is oxygen bleach, like mentioned above, or chlorine bleach, which are both particularly good at cleaning tile and grout. Just be careful on using them on various colored surfaces. Remember to use all washroom cleaning products safely, and look into the surfaces of your washroom to determine the best possible product for you. Elena Prokopets is an associate editor at various news magazines like the Huffington Post. She is a full time marketing manager at hygo.com.uk/. With a passion for all things DIY, she enjoys helping and teaching others how to renovate their homes. Nice and useful piece of info its really work.